A thatched roof is one of the most distinguishing features of a traditional English cottage. While thatched roofs have a classic look and feel, there are reasons why they’ve been superseded by more modern building materials — chief among them their high cost and extensive maintenance requirements. A false thatched roof from Custom Shingles captures the visual qualities of its namesake, without the hassle. Using cedar or other wood shingles, our false thatched roofs have a natural textured appearance that speaks to history and tradition while offering modern convenience and all-weather performance. Multiple color options and configurations are available, allowing for a wide range of design flexibility. Keep reading for more information about adding a wood thatched roof to a new or existing home. Custom Shingles uses exceptionally high-quality materials and traditional construction techniques to create false thatched roofs with impressive visual appeal and long-lasting performance. Our shingles are available in western red, Alaskan yellow and eastern white cedar, as well as teak and Royalwood™ Wallaba — all sustainably harvested woods that offer good durability and great looks. Individual shingles are steam-bent to create gentle wave coursing that mimics the look of English thatch. 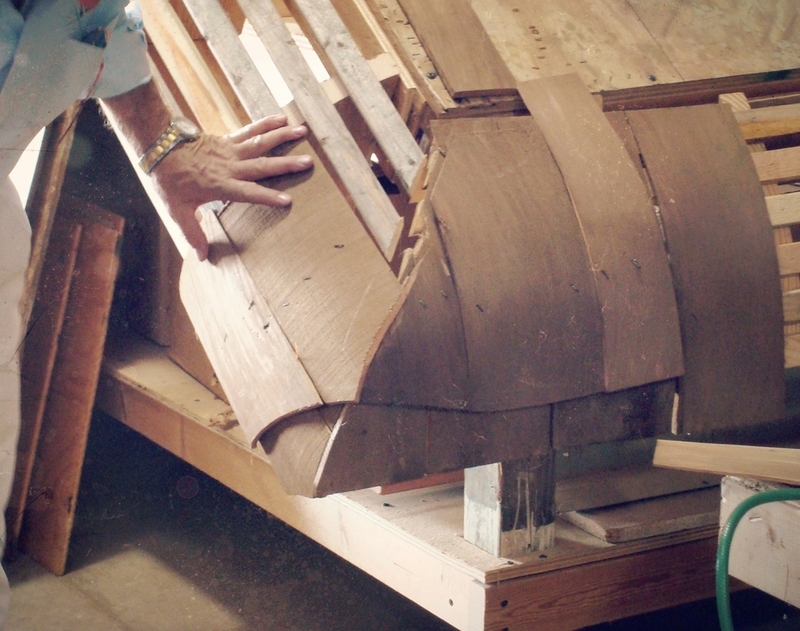 This painstaking process results in a finished product that’s entirely unique from roofs made of mass-produced shingles. Custom Shingles is often called upon for historical restorations and other special roofing projects. One of the most exciting and visually striking American thatched roofs we’ve completed is the Five-Color Masterpiece, which you can read about and see pictures of in our blog. To create the variegated effect of this roof, individual shingles were stained five different colors. The end result is a roof that hints at traditional English thatching while retaining a bright, modern look that complements the home’s Tudor-style architecture in an impressive way. The Five-Color Masterpiece is just one example of how Custom Shingles-inspired designs are transforming homes around the world. As a leading expert in cedar thatching, we can help you with everything from the design phase to the long-term maintenance of your roof. Our wood shingles can be treated for fire- and weather-resistance. We also employ a special pressure washing process to clear away moss and ensure it stays off your roof for longer. Weak: One of the most significant disadvantages of synthetic thatch is the structural weakness of this roofing type. A thatched roof comprised of synthetic material will generally lack sufficient strength to bear the elements in most environments. Unless you live in an area with neutral weather throughout a typical year — which is a rarity in the 21st century — synthetic thatch is an impractical roofing choice. Vulnerable: Artificial thatch can render your home exposed to the elements. From the strong winds of fall to the harsh snowstorms of winter, a roof made of synthetic thatch is unlikely to last for very many seasons without the need for repairs. Infestation: The purpose of a home is to seal off the outside and keep out unwanted guests, including insects and rodents. With a synthetically thatched roof, holes are liable to open across the roof in short order that could expose an interior to mites, mice and a range of other infesting creatures. Fire: Here in the 21st century, all homes should be constructed with maximum resistance to flames. To that end, homeowners should avoid roofing that presents any fire hazard. Of all the roofing options on the market, few are as susceptible to flames as synthetic thatch roofing. Simply put, a synthetic thatch roof could render your entire home vulnerable to fire. Lightning: The effects of lightning could be disastrous on a roof with synthetic thatching. In the mayhem of a thunderstorm, a lightning bolt could rip a major hole directly through a synthetically thatched roof and leave the interior vulnerable to rain and the elements. In some cases, the effects could be even worse. Coldness: Due to the lack of strength in synthetic thatch, roofs made of such material offer poor insulation. Consequently, homes with this type of roofing are liable to be cold during winter months. If you live in a colder climate, you could face astronomical heating bills between November and February with synthetic thatch roofing. Humidity: By the same token as the winter coldness factor, synthetic thatch roofing is ineffective at blocking out moisture during summer months. If you live in an area where summer highs typically exceed the 80-degree range, you could find yourself overusing your household cooling system and paying steep summer energy bills with a synthetically thatched roof. Disrepair: A roof made of synthetic thatching is liable to need maintenance on a far more frequent basis than other roofing types. To protect synthetic thatch, such roofing generally requires quarterly inspections, and possibly more. Unless you're a home-repair handyperson who loves getting on your roof, any aesthetic appeal that synthetic thatch might offer is hardly worth the effort. Short Lifespan: Synthetic thatch has one of the shortest lifespans of all roofing types. As such, synthetic thatch is a vanity investment with little payback. During the typical span of a residential occupancy — anywhere from eight to 15 years — you will generally need to replace a synthetically thatched roof at least once. Natural: A false thatched roof made of cedar material provides a natural charm that blends in with its surroundings. Whether your home is situated in a forest or along a seaside, false thatch will render your home with a natural elegance that is bound to be the envy of guests and onlookers. Steam-Shaped: Cedar shingles are steam-bent to provide a thick texture and eye-capturing appearance. Shingles of this variety provide strong roofing that keeps interiors warm and protected throughout the year. With a false thatched cedar roof, your home will be comfortable for years to come. Distinct: Thatched cedar shingles provide one of the most distinct looks on homes of all ages. Throughout the U.S., homeowners with a love for unique home architecture have chosen thatched roofing because it resembles no other roofing on the market. Whether your tastes are subtle or exotic, a thatched roof could be the perfect finishing touch. Classic: Unlike some roofing options that are bound to go out of style, thatch provides a classic look that works on everything from 19th-century bungalows to newer homes on the market. Aesthetically, thatched roofs will most likely withstand the test of time for decades and centuries to come. Timeless: Thatch roofing has been around for centuries, hence its ageless appeal. From the villages of Tudorian England to the cottages of Colonial America, thatch has been the roofing choice on some of the most iconic and revered homes throughout the ages. Integrity: If you live in a classic home that was built with a thatched roof, new thatched roofing will allow you to preserve the integrity of the home's original design. Unlike so many modern types of roofing that radically alter the appearance of older homes, thatch made of cedar is classic yet stronger than the thatching of old. Colorful: False thatch is made of cedar wood, which comes in a variety of colors. Custom Shingles offers roofing made of Alaskan yellow, western red and eastern white cedar among numerous other options. As the shingles age, the colors blend evermore naturally in with the surroundings of a given home. Age Well: Cedar is among the few types of roofing that looks good regardless of its age. As long as the roofing is well-maintained throughout the years that you occupy a property, false thatch made of cedar will serve as a visual enhancement that adds color to your home. Complementary: Thatch roofing has a one-of-a-kind natural look that blends in with outdoor settings. If your house is in the countryside, a thatched roof could serve as the perfect complement to the nearby trees, wood and greenery. If you live in a village, a thatch roof will add visual dimension to the surroundings. Value: A thatched roof can add value to your home. As a distinctive type of roofing associated with class and timelessness, thatch has grown in popularity among discerning home buyers. With cedar thatch on your roof, your home is liable to attract more attention and higher offers when you place it on the market. Overall, faux thatch roofing is stronger, more durable and longer-lasting than artificial thatch. As such, a faux thatch roof that is customized from cedar will keep your home better protected against weather, rodents and the elements. Strong: Faux thatch roofing is durable and therefore reliable in the more severe climates of the 21st century. With a faux thatch roof, there is little need to worry about holes, leaks and other problems that are relatively normal with synthetic thatch. Durable: Faux thatch roofing is one of the most robust options on today's roofing market. A roof made of cedar thatch will generally withstand weather and the elements throughout the average span of a residential occupancy. Since the shingles are steam-treated, they are already proofed against the expansion/contraction effects of temperature change. Solid: Faux thatch roofing is stable overall. Unlike synthetic thatch, which can leak in short order, faux thatch will keep your interior safe from the harshest rains and snowstorms for many winters to come. A faux thatch roof will also withstand various forms of abuse, such as pecking birds and falling pine cones. Infestation: With a faux thatch roof, you don't need to be in constant fear of rodent and bug infestation. Whereas synthetic thatch is generally weak and can allow for numerous openings, a thatch roof comprised of cedar will seal out mice, squirrels, termites, moths and other unwanted guests. Fire: Regardless of your roofing choice, fire-safety should be one of your foremost concerns. This is especially important in hot climates that are more susceptible to fire. Faux thatch roofing can be treated with flame-retardant chemicals for extra safety. Synthetic thatch, by contrast, is one of the more dangerous roofing options in this regard. Lightning: Faux thatch roofing is safer in all ways compared to synthetic thatch, even when it comes to lightning. A cedar thatch roof can be equipped with a lightning rod to intercept a bolt that could otherwise ravage a roof and endanger a home and its occupants. Insulation: A house with a faux thatch roof is better equipped to withstand the winter cold. If you live in an unusually chilly climate, faux thatch made of cedar could be one of your best options in a new roof. The thickness of faux thatch has an insulating quality that traps heat and allows you to ease up on your winter heating costs. Heat Resistance: A house roofed with faux thatch is also better-equipped to seal out humidity during summertime. If you find yourself cranking the A/C around the clock between late June and early September, a new roof made of cedar thatch shingles could help you ease up on your summer electric bills. Longevity: Faux thatch is one of the longer-lasting options of all the classic roofing types. Faux thatch made of cedar is treated to withstand the elements and remain intact for many passing seasons. As long as the thatch is adequately maintained, a roof of this type could last for 20 years or more. Faux thatch is custom-made from cedar shingles, which require far less maintenance than artificial thatch. As long as false thatch is given the periodic inspections of any strong roofing type, the cedar can last for the entire time you own your property. Inspections: With periodic and timely inspections of faux thatch, a roof of this type should last for many years. On a biannual basis — preferably in March and November — a roof should be inspected for signs of wear. On the brink of winter, look for any drain clogs of foliage buildup that might obstruct the flow of water. As spring sets in, clear away fallen branches and check for cracks in the shingles. Tree Trimming: Overhanging branches can pose several dangers to your home and the roof in particular. When branches fall, they can damage shingles. Branches can also serve as pathways to your roof for crawling critters. Make sure tree branches do not come within three feet of your roof. Preferably, no tree should be within six feet of your house. Fire-Proofing: Faux thatch roofing can and should be treated to resist flames. Unlike stone and metal roofs, shingles made of wood or straw are generally vulnerable to fire unless you treat them beforehand with fire-retardant chemicals. Regardless of your environment, fire can pose a major threat. With a fire-resistant roof, flames are less likely to engulf your home in the event of exposure. Moss-Retardant: The buildup of moss on cedar shingles can lead to mold development, which can weaken a roof's structural integrity. It is therefore essential to have a roof washed away of any mold growth before such problems spiral out of hand. Custom Shingles employs a pressure-sensitive washing method that cleans faux thatch without the risk factors of a power wash. Repairs: On faux thatch, the damage is usually isolated to select areas in the rare instances when it does occur. As long as the damage is quickly remedied, the problem can be uprooted before it spreads to other parts of a roof. If and when repairs are needed on a faux thatch roof, Custom Shingles can perform the work quickly and easily. Inner Reinforcement: A roof can be rendered even stronger with interior reinforcement. On the ceiling of an attic, the use of insulation helps to prevent the freezing and subsequent absorption of winter rainwater into your roof. Reinforcements can also serve as an extra barrier that helps to slow the spread of external damage, such as the formation of holes that might otherwise serve as openings for rodents. When the time comes to replace the roofing on your home, it is best to choose a style that complements the façade and your exterior surroundings. It is also wise to select a roofing style that can add value to your home and keep the interior insulated and protected for years on end. With a cedar thatch roof, your home will be warmer in the winter, cooler during the summer, safer year-round and the envy of everyone. At Custom Shingles, we specialize in faux thatch roofing customized from cedar. Our team performs roofing installations, repairs and restorations on homes both new and old. Call or contact us today for more information.